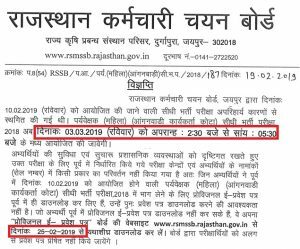 Rajasthan Anganwadi Admit Card:- Hello Friends, The RSMSSB Department ready to announce the RSMSSB Anganwadi Supervisor Admit Card 2019. Applicants are eligible to access the Rajasthan Anganwadi Mahila Supervisor Admit Card 2019. RSMSSB conduct the Mahila Supervisor on 3rd March 2019. For the latest updates, You have regularly visited here. The Rajasthan Staff Selection Board recently announced 309 Anganwadi Supervisor posts for the experienced women, who have already served in the Anganwadi department, Now the RSMSSB ready to disclose the Rajasthan Anganwadi Mahila Supervisor Admit Card for the written exam. The RSMSSB had notified to conduct the Anganwadi Mahila Supervisor Written Exam on 3rd March. 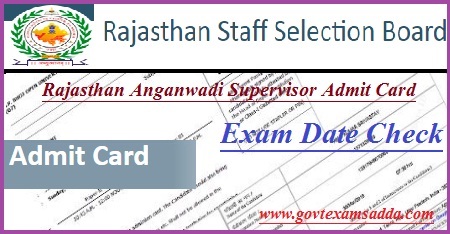 Rajasthan Staff Selection Board update the RSMSSB Anganwadi Supervisor Admit Card 2019 on 25th Feb. We have provide here the official link by which you can easily download your Rajasthan Anganwadi Supervisor Admit Card 2019. The Department official release the Anganwadi Mahila Supervisor Exam Date. The examination cell disclosed an official update regarding the RSMSSB Anganwadi Female Supervisor Admit Card 2019. Applicants may download his/her admit card from the official page and appear in the examination at the given examination center. The Admit Card is a mandatory document to appear in the examination hall. Applicants who have valid Rajasthan Anganwadi Supervisor Admit Card 2019 can enter inside the examination hall and attempt the written exam. The RSMSSB releases the Rajasthan Anganwadi Hall Ticket 2019 through the online mode only. There will be no other option to download Anganwadi Worker Admit Card. We have advised to all that after the downloading the RSMSSB Anganwadi Supervisor Admit Card, you have read the complete instructions also. The RSMSSB Anganwadi Supervisor Admit Card released. Applicants can not appear in the exam without Rajasthan Anganwadi Worker Hall Ticket 2019. So If you want to be govt job in Rajasthan then you have required to qualify the Anganwadi Mahila supervisor Written exam. The RSMSSB announce Mahila Karykarta 2019 Admit Card. You can access your RSMSSB Mahila Karykarta 2019 Admit Card through the board’s home page. The offline exam will be conducted by the department. The exam will be objective type (MCQ). Total 200 questions will be asked for 200 Marks. The exam duration will be 3 Hours also. Candidates must visit the RSMSSB official Portal. Now search Rajasthan Anganwadi Admit Card link on the home page. Now fill the required details in it like registration no., D.O.B etc. Your RSMSSB Supervisor Hall Ticket 2019 will appear on your screen. Contenders are ready to access their Mahila Worker Admit Card 2019. They also carry the User ID & Password during downloading the RSMSSB Women Supervisor Admit Card 2019. The Mahila Karykarta Hall Ticket is a necessary and crucial document to enter the examinations hall. If you have facing problem to access Rajasthan Anganwadi Supervisor Hall Ticket then they can comment us. Our experts will give you a proper solution.